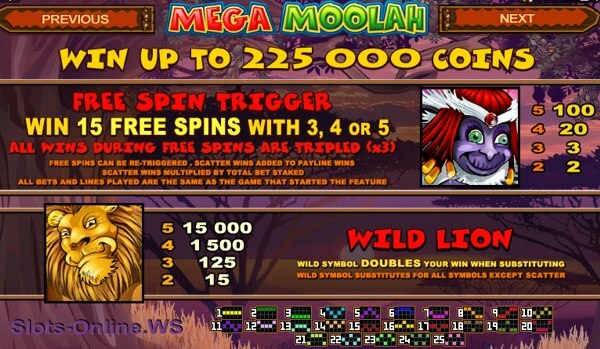 Mega Moolah is a 5 reel, 25 pay-line slot machine with free spins and a bonus game that can bring you a mega multi-million-dollar progressive jackpot. The minimum jackpot (seed) starts at $1 million and grows. In fact there are 4 progressive jackpots, so players have a chance to win a jackpot for $0.25 a spin as the coin size can be altered from just 1c to 5c on this video slot. 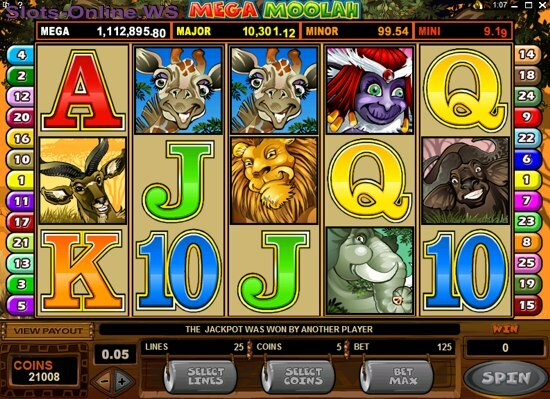 Mega Moolah was released in November 2006 and now available at most Microgaming online casinos. 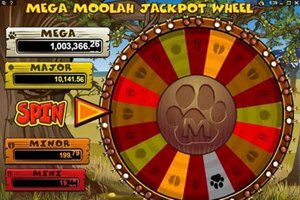 Mega Moolah has an African theme with graphics reminiscent of Disney's "The Lion King." The Wild Lion symbol is a Wild symbol and substitutes for any other symbol to complete winning combinations, except the Scatter Monkey symbol. The Wild Lion symbol works also as a X2 Multiplier symbol and doubles the payout of any winning combination it completes. The biggest jackpot win in the base game is 15,000 coins if you hit 5 Lions. With 2 or more scatter Monkey you win at least 2 coins, up to 100 coins for 5 symbols scattered anywhere on the reels. In addition to the Lion and the Monkey, watch out for symbols of other animals including antelope, zebras, elephants, giraffes, and water buffalo that may compose winning combinations. The remaining symbols are comprised of the letters A, K, Q, J, and the numbers 10 and 9. Get 3, 4 or 5 Scatter Monkey symbols anywhere on the reels and you will be awarded 15 free spins and all your winnings during the free spins round will be tripled (X3). And even more free spins can be won during the free spins. The bonus feature game is randomly triggered. The higher your bet the greater your chance of winning the progressive jackpot are, so we would recommend you betting max 25 lines on each spin. 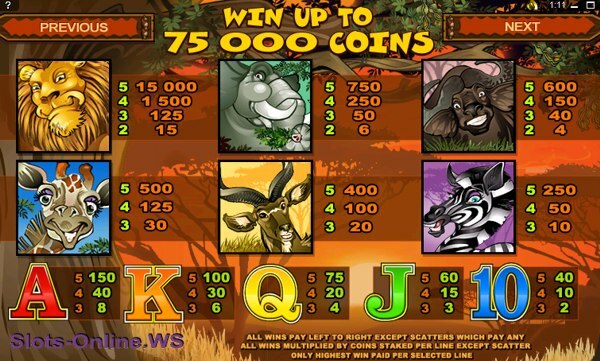 The Bonus game is an African safari style take on the wheel of fortune bonus game. During the bonus game you spin a jackpot wheel with white, yellow, orange, and red spaces. There is one white space - that's the Mega Progressive jackpot (starting at $1,000,000). In addition to the white space, there are three yellow spaces (Major Progressive with $10,000 minimum value), six orange spaces (Minor Progressive of $100 min), and 10 red spaces (Mini Progressive with $10+ jackpot). Mega Moolah is very popular video slot due to small coin sizes, great number of winning opportunities and 2 bonus features. With the highest ever win of $1,445,684.65 we are waiting for the record to be broken soon as the Mega Moolah jackpot in already crossed $4 million mark! (See current jackpot value here). And taking into account that the jackpot is available in the currency that you play (USD, Euro, CAD or Pound Sterling), the next win will be possibly the largest ever online jackpot hit! Luxury Casino - Collect up to €/$1,000 free in welcome bonuses on your first 5 deposits. Lion's Pride - Free Spins 100 Line Slot Machine. Jungle King - Bonus Feature 25 Line Slot Machine. Safari Slot - Bonus Feature 20 Line Slot Machine. Mega Moolah Promotion And Four New Slots At Casino Rewards Group. Mega Moolah Promotion at Casino Rewards Let's start the year off with a bang..
Four New Microgaming Video Slots Including Mega Moolah 'Summertime' At 32Red Online Casino This May. Four slot machine games listed below are..